Although, Bernard Bee left Texas in 1846, his service as Texas Secretary of State and Texas Secretary of War, was enough to have both county and county seat named in his honor. Early settlers in the 1830s lost family members to Indian raids. 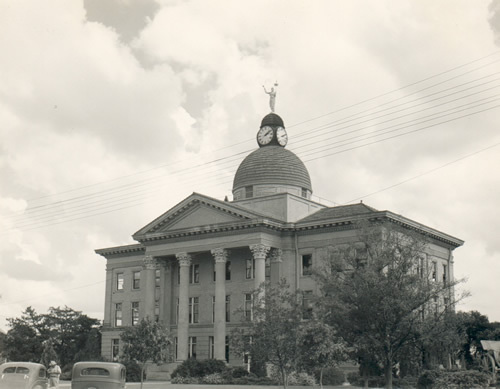 The county was organized in 1858 and the county seat was about 7 miles from the current courthouse. A post office was established in 1859 and the next year the first courthouse was built. Beeville only had about 300 people in 1880, but when the San Antonio and Aransas Pass Railroad came through in 1886, the population rose to one thousand. 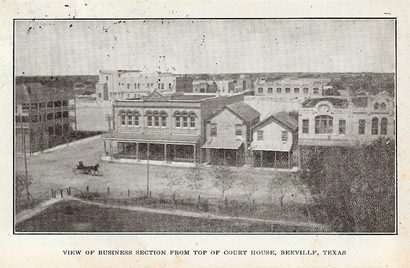 Beeville got a water works and electricity in 1903 and the sewer was built in 1910. There was a small oil boom in 1929, but it wasn't enough for Beeville to escape the Great Depression. A Naval Aviation Station was set up during World War II and although it was deactivated at war's end, it was reopened for Korea. It was closed again in 1992, and a reminder of its presence is noted by the aircraft on the courthouse lawn. 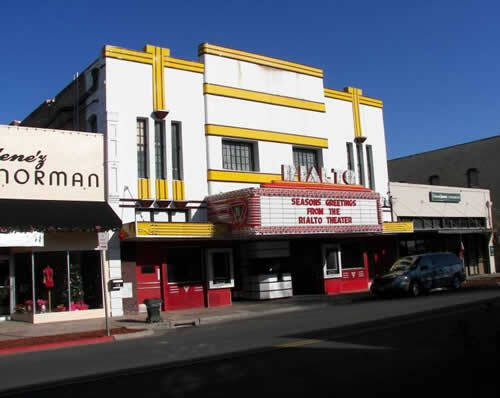 About the time this building went up in the 1920s, Beeville was paving its streets. 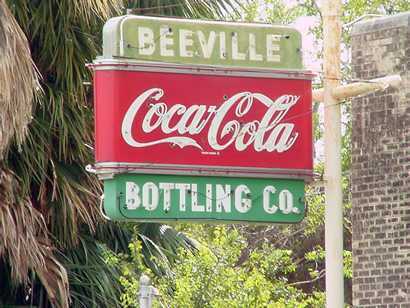 The Beeville Bee and The Picayune, the towns rival newspapers merged in 1928. Long before Mexico granted land (1834) on Poesta Creek to the first settlers, Anne Burke and James Heffernan, savage Indians roamed this valley at will. Their colony, although successful at first, soon met disaster. In 1836 James Heffernan, his brother John, and John Ryan, who had planned to join Texas patriots at Goliad, were planting a crop in a field at this site when they were massacred by Comanches. Also killed was James' family, in his picket house upcreek. 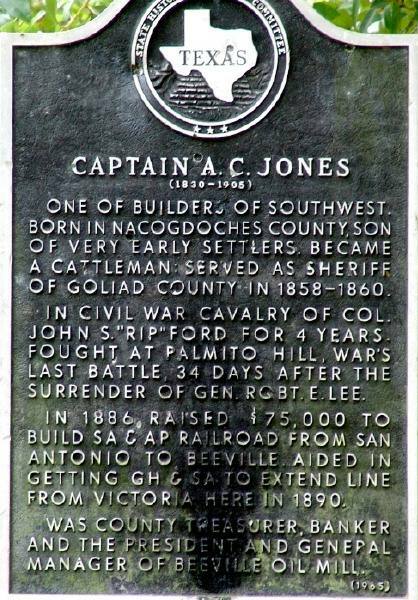 Bee County was organized in 1858 and named for Col. Barnard E. Bee, a Republic of Texas statesman. Soon after, choice of a county seat came into hot dispute. A site seven miles east, on Medio Creek, was chosen for "Beeville". But ten months later, voters made the 150-acre donation of Anne Burke "O'Carroll permanent county seat, on the banks on the Poesta. 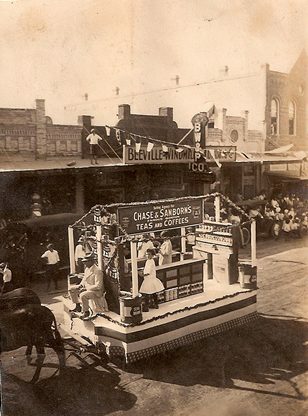 The new town, first called "Maryville" for Mary Heffernan (relative of those killed in 1836) was soon renamed Beeville. In its first decade, it had two stores, one saloon, and a blacksmith shop. First courthouse was built for $750 on west side of present square, 1860. First railroad came through, 1866, and a larger courthouse was soon built. 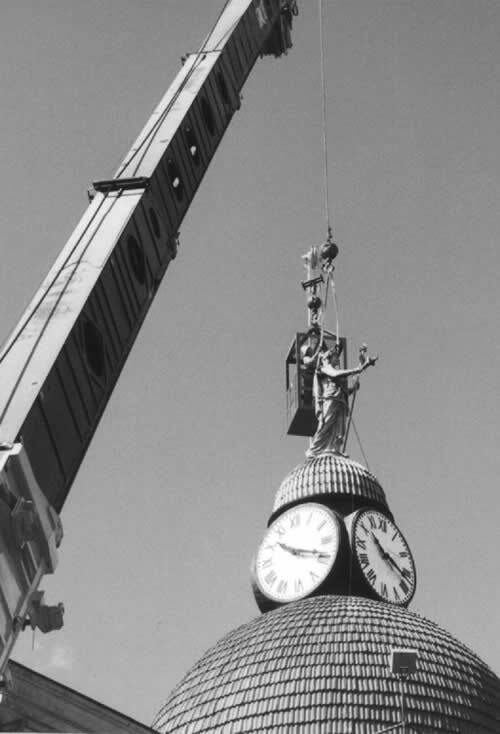 After it burned, the present one was erected in 1913. The 1912 Bee County Courthouse has most of the accessories you look for in a courthouse - A clock, dome, statue of the Goddess of Justice and large Corinthian columns. 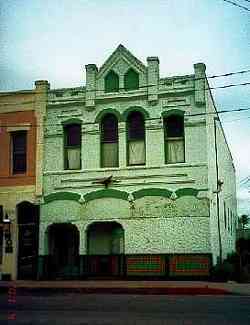 Beeville Art Museum - 401 E. Fannin Street. Phone: 361-358-8615. Hours: Tuesdays - Saturdays, 9 to 5. Veterans Memorial Park (200 acres) is the largest of eight city parks. 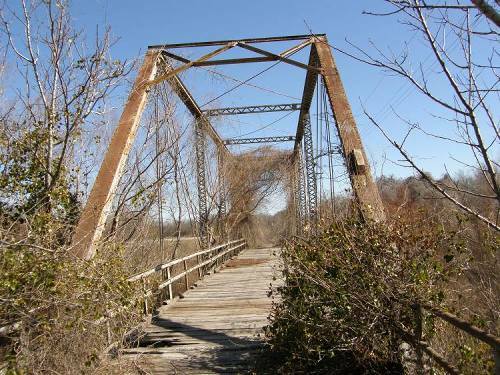 From pack trails and wagon roads that marked this area at least 300 years, have developed such modern roads as U.S. Highway 181. The old trails of Indians, wild cattle and mustang horses formed highways for 17th, 18th and 19th century expeditions coming from Mexico to claim sovereignty for Spain over land of Texas. When pioneers established land grants in this section, they also found Indian trails useful, placing towns along them. 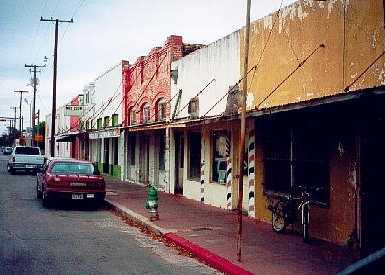 Beeville, the county seat, was situated at the natural intersection of San Patricio-Helena Road with Goliad-Laredo Road. About 20 miles south, the Matamoros-Goliad road ("Camino Real" to old-timers) was probably the most historic road in this area. 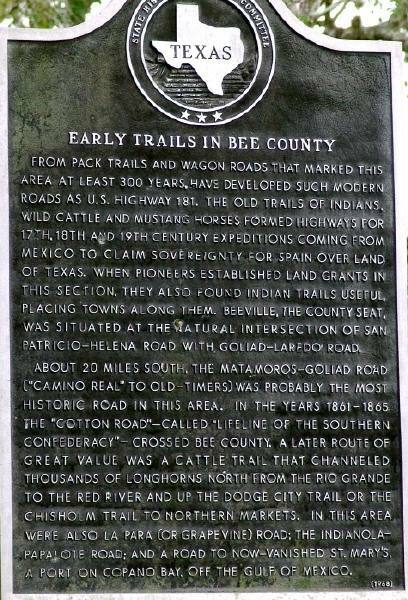 In the years 1861-1865 the "cotton road"--called "lifeline of the southern Confederacy"--crossed Bee County. A later route of great value was a cattle trail that channeled thousands of Longhorns from the Rio Grande to the Red River and up the Dodge City Trail or the Chisholm Trail to northern markets. In this area were also La Para (or Grapevine) Road; the Indianola-Papalote Road; and a road to now vanished St. Mary's, a port on Copano Bay, off the Gulf of Mexico. Bee County Chamber of Commerce - 361-358-3267. 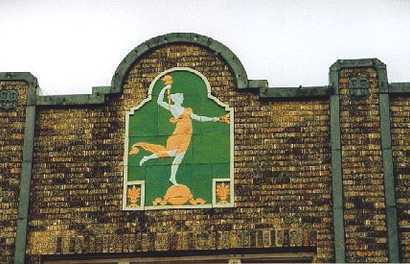 The building with "The Spirit of Progress" on it was a Montgomery-Ward store. There's another one on your Hillsboro page. This image was M-W's logo and appears on many of their storefronts from the early 20th century. It's a good way to spot old M-W stores that have been converted to new uses. I just discovered your website today and have been enjoying it immensely. I grew up in Plainview and Lubbock but have lived away from Texas since 1966. Your photos have sent me on a real nostalgia trip.